Following my previous post about energy, where I somewhat romanticized the notion of poverty and low energy usage in South Africa, I thought I should be honest and show the entire picture. South Africa, you see, is building the world’s largest dry-cooled coal-fired power plant. 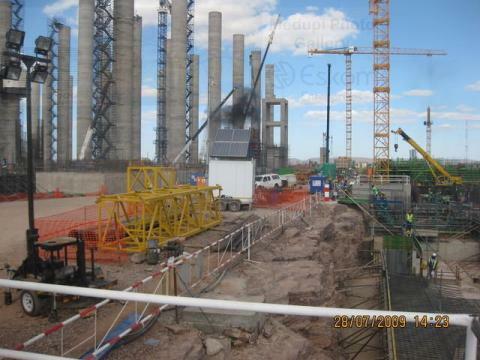 When completed, the Medupi Power Station will have six boilers powering an 800 MW turbine each. No other coal plant has ever been built on this scale. It is commissioned by Eskom and subcontracted to Hitachi and Allstom, who employ a series of other subcontractors. A lot of jobs are dependent on this project, as well as the other power station built in Kusile. How does South Africa have the money for such a huge enterprise (projected at over R100 Billion)? Well – electricity rates have gone up three times in the last few years (and you’ll remember that we contributed an additional R795 to Eskom) so that in the long term the plant will finance itself. The loan to finance construction is backed by the South African government, which in turn gets backing from the World Bank. You might remember there was a brief delay some time back when President Obama balked at so much World Bank involvement in yet another “dirty” technology, but it was approved in the end. My guess is if Michelle had to schedule her cooking and laundry around everyday power outages (the norm here just two years ago), she would have been on Barack’s case to approve another coal plant in a hurry! What’s really cool about this plant is its dry-cooling technology (no pun intended). Turbines need to be cooled, and historically that was done using water. Which is why you often see power plants next to a lake. But water is a scarce resource (and will become much more so in the years to come), so the relatively new technology of dry cooling is the way of the future, especially in arid or semi-arid regions like South Africa. The first boiler is scheduled to go online in 2012, but I’m not holding my breath. It’s not easy to manage such a big project in the best of circumstances, and South Africa has additional challenges. I doesn’t have enough of a skilled workforce, for instance. There is the culture of strikes which seriously hobble progress on the site (and elsewhere – my fingers are frozen as I’m typing this while I’m still waiting for new gas to be delivered), a history of shoddy work, even bomb threats. Nevertheless, the work at Medupi is steadily moving forward. And so is South Africa. Previous PostPrevious Who Uses the Most Energy?